Allergy Advice: Contains Shrimp, Soybean, Wheat, Oyster, Fish. Ingredients: Chilli Paste (Chilli, Shallot, Garlic, Shrimp Paste (Shrimp, Salt), Palm Oil) (70%), Oyster Sauce (Soybean, Wheat, Oyster, Salt), Salt, Sugar, Soybean Oil, Fish Sauce (Anchovy Fish, Salt, Sugar), Stabiliser (E415), Flavouring. 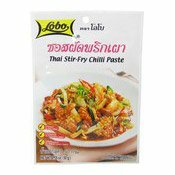 Simply enter your details below and we will send you an e-mail when “Thai Stir-Fry Chilli Paste (泰國辣炒醬)” is back in stock!